In the blink of an eye, your entire world can be turned upside down because of another person’s negligence. When this occurs, you need an experienced and dedicated personal injury law firm on your side to fight the tough battles for you, so you can focus on what’s important -- your recovery. Choosing the right law firm is a critical decision that will have a significant impact on your ability to collect the compensation you need. To successfully stand up for your rights, you need a San Jose personal injury lawyer with considerable trial experience, a formidable reputation, and the financial resources to fully investigate and develop your case for maximum compensation. The law firm of Corsiglia, McMahon & Allard, LLP is that law firm. We possess the strengths and the skills needed to win your case and our track record of success speaks for itself – eight times in the last eleven years our attorneys have received the Trial Lawyer of the Year award for their work on behalf of injured clients. No other law firm in the San Francisco Bay Area can match that record of accomplishment. Insurance companies recognize our trial skills and as a result, our clients receive top compensation for their injuries. From the moment you step into our office you are not just a case number - you are our number one priority. It’s our outstanding case results and our personal dedication that separates us from the others, and why so many of our clients continue to recommend us to their friends and families. No matter how badly you are injured, we are there to help. With an office conveniently located in San Jose, we are able to serve injured accident victims throughout San Jose, Santa Clara County, the San Francisco Bay Area, and Northern California. At Corsiglia, McMahon & Allard, LLP, our attorneys are trial attorneys first and foremost. While every attempt is made to settle your case out of court, we aren’t afraid to go to trial to achieve maximum case results and hold negligent parties accountable. Our litigation experience is unparalleled and one of the reasons why we are able to obtain significantly more compensation for our injured clients. Our firm has built a solid and outstanding reputation throughout Northern California and are nationally recognized trial attorneys. As personal injury trial attorneys we help our clients recover the money they need to offset the financial losses they’ve endured because of their accident. From large corporations who produce products that injure consumers to reckless drivers who cause car crash injuries we hold wrongdoers responsible, so that justice is served. Through litigation, we can go beyond helping the victim heal - we can help an entire community become a safer place. At Corsiglia, McMahon & Allard, LLP, our San Jose personal injury attorneys don’t cut corners when it comes to any case. No matter how complex or how small, we approach every case as if we are going to trial. We meticulously investigate all angles of the accident to build a strong and solid case for our clients. Our lawyers are prepared to go the distance and we fight aggressively to protect our clients’ rights to compensation after an accident. We’ve gone toe-to-toe with the largest corporations in the country, aggressively pursued full compensation, and obtained justice. 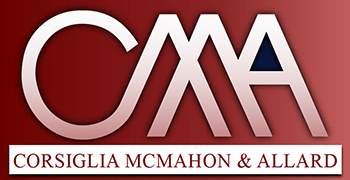 When you choose Corsiglia McMahon & Allard LLP, you won’t just have a lawyer, you will have an entire team of attorneys and experts on your side. Our law firm has the resources needed to hire top experts, reconstructionists, doctors, and specialists and build the team that will maximize the value of your case and if necessary, win your case at trial. We work together with these experts to fight for you and your loved ones throughout the legal process. If you have been injured in a car accident, you may be entitled to financial compensation for your medical bills, lost wages, damage to your property along with pain and suffering. Car accidents can be life-changing and can result in permanent and complete disability, as well as a lifetime of pain and suffering. When this occurs, turn to our law firm for assistance. It is important to understand that many trucking companies have their own accident response teams that are dispatched immediately to the accident scene. These accident response teams start their own investigation, collect evidence, and start developing a defense with well-financed law firms against your truck injury accident claim. When you retain Corsiglia, McMahon & Allard, we start working up the case with an eye towards holding the negligent parties accountable in a jury trial. Our experience has shown that unless you are prepared for trial, you will not receive a fair offer of compensation. It is no secret that the public, which sits as jurors on motorcycle injury accident cases, holds a negative view of motorcyclists. Whether their view is based on so-called lane-splitting or reckless behavior, insurance companies know that you have an uphill battle to prove your case. At Corsiglia, McMahon and Allard, you are represented by experienced San Jose personal injury lawyers with a proven track record of fighting for injured motorcyclists. Attorney Timothy McMahon just won a $6.95 million jury verdict on behalf of a motorcyclist who was rear-ended by a car, even though the defendant tried to use a lane-splitting argument. Bicycle riders have a reputation one step below motorcyclists when it comes to how the general public and a jury perceives their actions. Yet, many times it is motorists who do not understand the law when it comes to bicycles. They often treat cyclists as an inconvenience or simply fail to notice them at all. Negligent driving by car and truck drivers causes countless serious injuries and deaths among bicycle riders every year. A traumatic brain injury, referred to as TBI, or even a mild traumatic brain injury can have wide-ranging consequences for the rest of your life. If you have suffered a head injury in an accident, you should act quickly to determine whether you have experienced a brain injury. Diagnosing a traumatic brain injury is a very complex matter. Documenting the extent of brain injuries and the consequences of those injuries over the course of a person’s life is a major undertaking. But it is one in which our attorneys do for our head and brain injury accident clients. A wrongful death claim is a lawsuit that can be brought by the spouse, children, brothers, sisters and other legal heirs of the person who was killed by the negligence of another person or company. The trial attorneys at Corsiglia, McMahon & Allard have a track record of successfully bringing wrongful death claims for fatalities suffered in auto accidents and truck accidents. If a third party was the cause of your accident or contributed to your injuries, you may be able to file a third-party lawsuit against the negligent entity. However, your ability to file this type of claim depends on establishing liability and having an aggressive law firm on your side. Our aggressive litigation approach has enabled us to collect compensation for our clients who have suffered a workplace injury. Some of our successful cases include a $4 million settlement for an unharnessed construction worker who fell from a roof structure, as well as a $3.5 million settlement for a leg and back injury sustained by a laborer on a commercial construction site. When department stores, landlords, and companies cut corners in safety, they put everyone at risk. At Corsiglia, McMahon & Allard, our premises liability litigation attorneys know that the best way to protect California consumers is to hold negligent businesses, landlords, and property owners accountable for the injuries they cause. Through litigation, we can help injured premises liability victims obtain the compensation they need, while also safeguarding the entire community. Our trial attorneys aren’t afraid to tackle complex premises liability accidents and we fight aggressively for maximum compensation. When manufacturers and corporations put profits before people, devastating injuries can occur. At Corsiglia, McMahon & Allard, our product liability litigation attorneys believe in holding irresponsible manufacturers accountable for their actions. We know that through aggressive and effective litigation, we can protect our injured clients and the entire community from harmful and defective products. Our lawyers are skilled trial attorneys and we can help you collect maximum compensation after you’ve been injured by a defective product. After an accident, injured victims often face an uphill battle when seeking compensation. Never sign anything without first speaking to one of our experienced trial attorneys. Our lawyers know the tactics that insurance companies use to reduce your settlement and we fight back. We don’t let large insurance companies take advantage of injury accident victims and we work tirelessly to protect victims’ rights every step of the way. If you or someone you love has been injured in an accident in San Jose, Santa Clara County, the San Francisco Bay Area or anywhere in Northern California, you need a law firm on your side that you can count on. With seven attorneys and a team of experts and support staff, the law firm of Corsiglia, McMahon & Allard is here when you need us most. We know what is at stake after an accident and we know the complications that can arise. We use this knowledge and our considerable experience to build a case that is designed to obtain maximum compensation for our clients. To learn more about how we can assist you after an accident, call us at 408-289-1417 to schedule a free consultation. One of our attorneys will meet with you personally to go over the details of your case and help you choose the legal option that is best for you and your family. Timothy McMahon Named 2018 Trial Lawyer of the Year Attorney Timothy McMahon is named the 2018 Trial Lawyer of the Year for securing a $6.945 million jury verdict for a motorcyclist rear-ended by a car. When the defendant’s insurer refused to pay the policy limit of $100,000 and then rejected settlement offers on several occasions thereafter, Mr. McMahon showed that if insurance companies don’t pay, Corsiglia, McMahon & Allard makes them pay. Brad Corsiglia Investigates Birth Injury Claims in Bay Area Attorney Brad Corsiglia is investigating birth injury claims at Bay Area hospitals. In the event that there is a link between the injury and the negligence of your doctor or other professional, we will vigorously pursue your claim to ensure that you get the compensation you deserve. Corsiglia, McMahon & Allard Helped Secure Record-Setting $8.2 Million Settlement in Sexual Abuse Case The Corsiglia, McMahon & Allard sexual abuse legal team helped secure a record-setting $8.2 million settlement for a young girl sexually abused by her youth soccer coach. The sexual abuse legal team continues to represent and work for childhood sexual abuse victims harmed by the negligence of schools and other institutions entrusted with the care of our children.